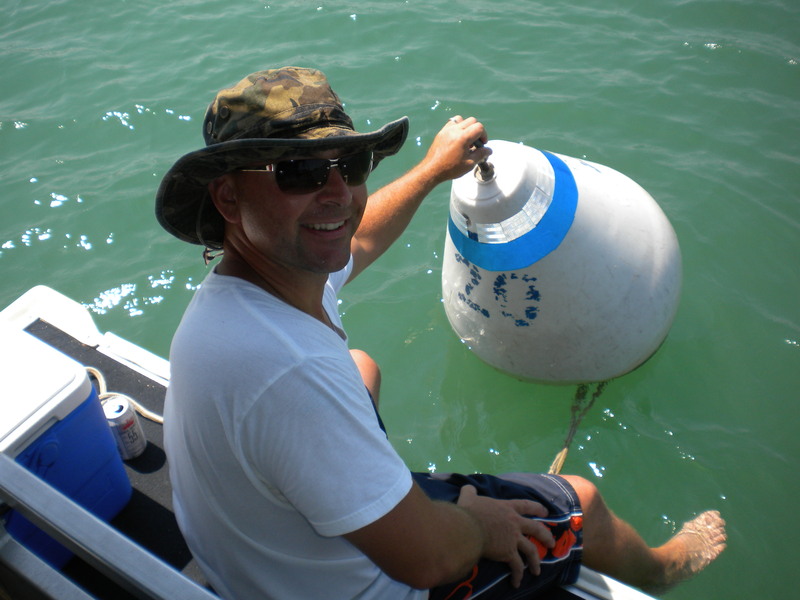 The Lake Murray Yacht Club mooring buoy project stemmed from the anchorage problem faced by boaters operating in predominantly rocky bottoms. The anchor will either not set because it skips along the hard bottom, or it catches securely between rocks, never to be seen again. The early Yacht clubbers tackled the problem with large mooring buoys attached to 2000 lb concrete slabs. The buoys were conical 25" diameter by 36" long, foam filled plastic hard shells. A center rod of threaded stock had galvanized steel eyes threaded on each end to attach the chain to the bottom and allow boat mooring to the top. The 5/16" galvanized chain connecting it all made for a convenient and safe anchorage for the largest boats. The club started at the marina, and numbered them all clockwise on the entire lake, #1 through # 72. Seeking coves with at least 15’ of water and sufficient space for tail spin around the anchorage, the Club placed some 40 mooring buoys. Times have changed and the boat sizes have increased. The wear and corrosion took their toll on the system too. The buoy riding the water surface elevated then dropped the chain endlessly. The lower portion of chain began failing from the constant movement of the links on one another. Club members rallied to the cause with more chain on the bottom, attached by divers. Then, for undetermined reasons, some of the flat cocrete anchor slabs began to fail and would not secure the bigger boats. The project was in need of a stimulus. The Club purchased 14 new buoys and upgraded the chain and the anchor weights. The high grade 3/8" galvanized chain was attached to concrete cubes [ versus slabs ] that should not crack under strain. Also there were now two of them, an anchor and a drag weight in tandem. This combination should preclude any significant movement under normal use. Thirteen of these moorings were set in the fall of 2008 by Club members. Not resting on a small success, the club has rallied members for buoy maintenance contributions. The 2009 contributions have been amazing; over $2000 and more than that in materials. 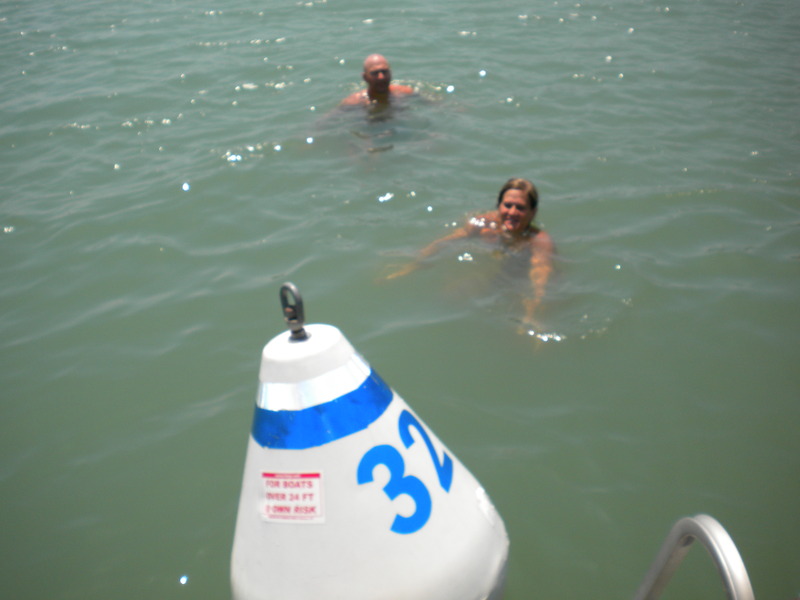 The original buoys are routinely retrieved form the lake for refurbishing and resetting. 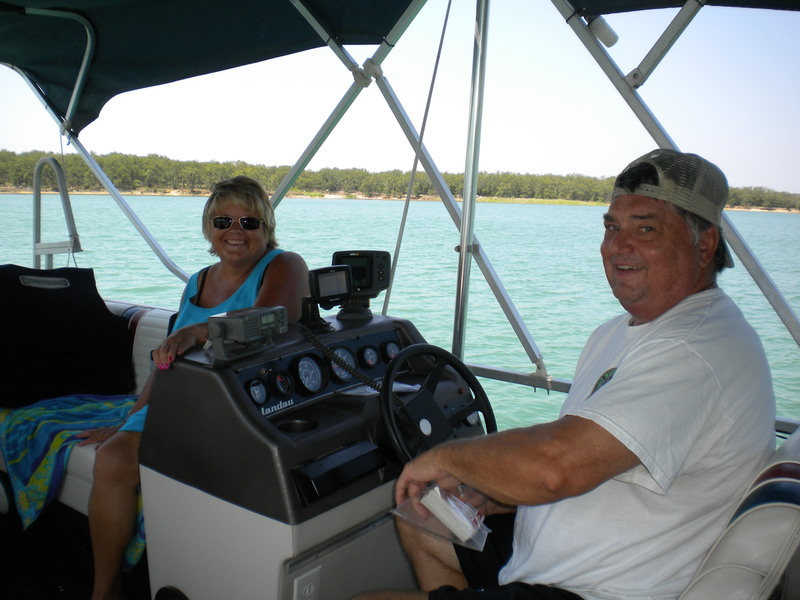 A 5/8" cable, shackle and swivel system will tether them to two concrete cubes provided complimentary by the Marina. Also Marina provided will be a barge, push boat and a driver to make the replacement possible. Anyone who discovers a damaged or adrift buoy is encouraged to report that finding to the marina office and to use the "contact us" page on this site. Buoy cleaning and relabeling is just a part of what LMYC does to maintain this mooring system for all of our fellow Murray boaters. Not worthy of Musketeer status, these three still came together to collaborate for a day of buoy service. 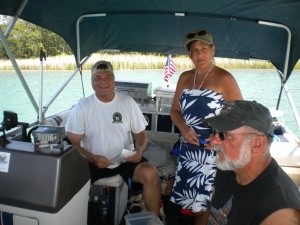 The helmsman and the reporter were captured here, considering which buoy should be next. These volunteers posed for the photo op as they paused in the shade after a successful working afternoon. Even before the official start of summer, the hot afternoons necessitate some cooling off.